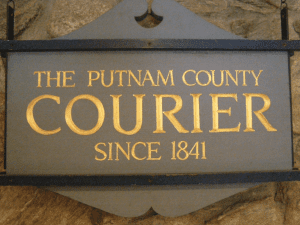 The Putnam County Courier has a long and storied history in the county seat. 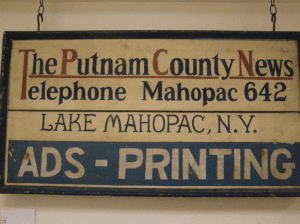 The paper’s first edition was published on June 27, 1841, as the Putnam Democrat. The paper was renamed the Democratic Courier in 1850. In the early 1900s, the paper became the Courier. Except for a brief time in the 1980s, when the publication was known as the Putnam Courier-Trader, the paper was always called the Courier. The Jewell family owned and operated the paper in the early portion of the 20th century, followed by John Mullen. Mullen died in a tragic crash and his widow, Virginia, sold the paper to Howard “Buzz” and Lynn Burr, who operated the publication until 1989. The paper was sold to the Housatonic Pubishing Company, and a decade later in 2000, Taconic Press assumed ownership of the publication. On Feb. 9, 2009, the paper printed its last edition under the Millbrook-based Taconic Corporation. The paper was resurrected by Elizabeth and Roger Ailes of Garrison, and six weeks later published its first edition under the new leadership of Mrs. Ailes as publisher and owner. On Dec. 15, 2016, editor Douglas Cunningham took over as owner, publisher and editor, of both the Courier and its sister paper, the Putnam County News & Recorder. The papers continue to operate out of a historically renovated building in Cold Spring. He can be reached at editor@pcnr.com, or 845-265-2468.